An ideal book for the artist looking for inspiration on what to paint, my oil painting artbook shows how the garden offers an array of subject matter that might at first seem mundane. Art demonstrations exploring essential oil painting techniques including alla prima, scumbling and glazing are explored along the way. Now in large edition. 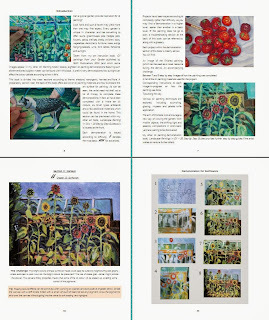 There are 18 step by step oil painting demonstrations within this oil painting guidebook, each featuring between 7 and 9 images in progress with in-depth instructions on how each painting had been completed. At the back of this book are two further demonstrations on how to prepare the art surface for oil painting, making a total of 20 demonstrations. 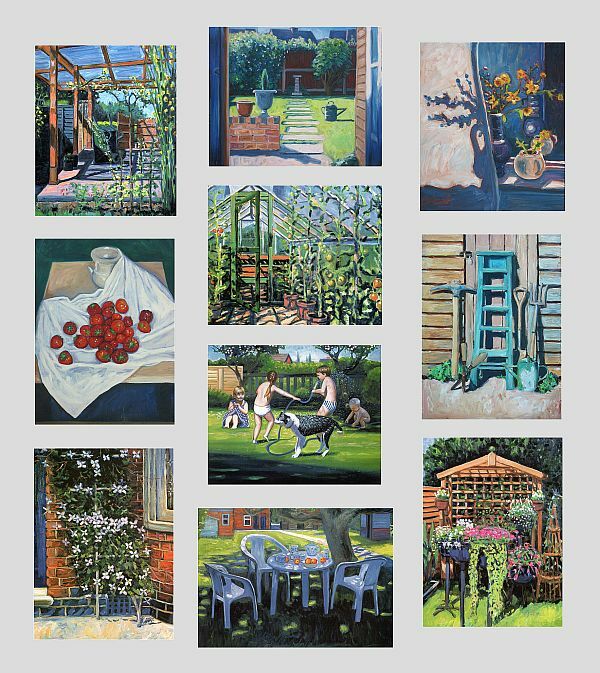 Sourced from my art instruction book, Oil paintings from your Garden published by GMC Publications 2002 (and which some images appear in my other Oil Painting Medic books), subject matter include sunflowers, garden tools, children, an arbor, sun-dappled lawns, swings, petunias, creeping clematis, trellises, greenhouses, sunlight and more. Projects may be tackled in any order, but for guidance, are divided into four levels, 1 to 4. Levels are assigned to complexity rather than difficulty, so a project in level one might prove a little more difficult than a painting in level 4. Subject matter are also categorized to four sections: shadows, nonorganic, harvest and flora. See preview on Youtube. Each project comprises an image of the finished painting presenting a challenge. This is followed by a list of the art materials required to complete the painting. Step by step images and instructions follow. A tip is thrown in at the end. If the painting does not go to plan, an in-depth troubleshooting section may help. All the paintings within this book have been completed with just 10 pigments, 6 artbrush types, artboards and a few additional materials. My book will show the artist does not have to shell out a lot of money to purchase the art materials needed. An in-depth guide on what to purchase and how to prepare the art surfaces for painting provide the proper groundwork prior to tackling each project within See screenshot below to get an idea of how the interior of the new large edition version looks. The image on the left shows the finished projects within. A preliminary demonstration exploring light. 18 step by step projects, with full colour illustrations of the painting in progress plus corresponding instructions, a challenge and a tip. Each project is assigned a level: 1, 2 3 and 4 for guidance. Various oil painting techniques are explored, namely: alla prima, scumbling, impasto, glazing, palette knives and sgraffito. A troubleshooting chapter offering guidance if the painting does not go to plan. A chapter on what art materials to buy for the demonstrations. A chapter on how to prepare the art surfaces for painting. This book is available in large edition, measuring 10x8in and 78 pages long. The pocket sized edition measures 8.5inx5.5in and is 116 pages long. Also available on Kindle. My other oil painting step by step book, Landscape Painting in Oils – 20 Step by Step Guides provides similar instructions on completing projects for landscape painting.